Is my money safe with DEGIRO? Your money will be received at DEGIRO by a separate foundation. If you don’t directly invest this money it will be automatically invested in one of the qualified Money Market Funds of Morgan Stanley Investment Management or Fundshare Fund Management. This is done via the standing order given by you during the registration process. DEGIRO believes that it is important that clients understand how the structure of these Money Market Funds works. DEGIRO is not a bank but an investment firm. In the Netherlands, investment firms are not allowed to hold the money of clients. Therefore, when you become a client of DEGIRO, you give a standing order to invest money into a Money Market Fund from either Morgan Stanley Investment Management or FundShare. As such, at DEGIRO you do not hold money. For every currency available in the WebTrader, a separate Money Market Fund is also available. The objective of a Money Market Fund is to realise a return that is equal to the market interest rate with as low risk as possible. An additional advantage to the low risk, is that your Money Market Fund participations, just like your other investments, are kept strictly separate from the assets of DEGIRO. "The objective of a Money Market Fund is to realise a return that is equal to the market interest rate with as low risk as possible." DEGIRO provides its clients with the option to choose between two Money Market Fund providers. These providers are FundShare and Morgan Stanley Investment Management. The Morgan Stanley Liquidity Funds are available in the currencies EUR, USD, and GBP. The Morgan Stanley Liquidity Funds are qualified Money Market Funds with an AAA rating and large in size, more than €20 billion. Morgan Stanley Investment Management is part of one of the largest business banks in the world. The FundShare Cash Funds are managed by FundShare Fund Management, a sister company of DEGIRO. FundShare manages qualified Money Market Funds in EUR, USD, GBP, CHF, SEK, NOK, HUF, DKK, and CZK. The fund managers of both FundShare and Morgan Stanley ensure that the funds comply with strict requirements. All available Money Market Funds are qualified Money Market Funds. The main objective of a Money Market Fund is to minimise risk. With the strict investment policy, this risk is very low. 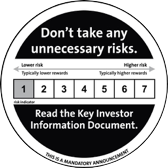 According to the Key Investor Information Document (KIID) of the funds, the risk level is a 1 on a scale from 1 to 7. For more information on the risks and the risk indicator as determined by the fund manager, we refer you to the prospectus, position reports and Key Investor Information Document (KIID) prepared by the fund manager on the website of FundShare and Morgan Stanley Investment Management. The KIIDs can also be found in our document centre. Please note: losses caused by these risks will not be compensated by DEGIRO. If you invest, you run a financial risk. The value of your investments may fluctuate. Results achieved in the past do not guarantee future performance. A qualifying Money Market Fund has a short average duration of 60 days. This means that the bonds in the portfolio are repaid on average within 60 days. This reduces the risk of no repayment. A qualifying Money Market Fund invests in so-called liquid bonds, which means that they are easily tradable and can therefore be converted quickly into money. Investing in a Money Market Fund is low risk but has a downside, namely in the form of a low return. For a few currencies, this return is currently negative, due to the negative market interest rates for short-term EUR bonds. Among others, the EUR Money Market Fund currently has a negative return. While any positive return on your investment into a Money Market Funds is yours, a negative return as a result of the current interest rates and fund costs is currently compensated in full by DEGIRO on a non-committal basis. Money Market Funds have no entry and exit costs. With DEGIRO you have the choice between FundShare and Morgan Stanley Liquidity Funds. The choice you make is important for your investment result. Next to the fact that the return differs per fund, there is also a difference in compensation for the EUR Money Market Funds. For the currency EUR you are only given compensation when you make use of the Morgan Stanley Liquidity Funds. When you become a client you give the standing order to invest your cash balance into these Money Market Funds. We wish to stress that DEGIRO, as well as the holding company behind DEGIRO, in no way receives any (financial) benefits (inducement) from Morgan Stanley Investment Management for the selection of these Money Market Funds. This is done because DEGIRO deems it wise to offer Money Market Funds that are managed by an administrator outside of the holding of which DEGIRO is also a part. Below you can find an overview (as of the end of June) of the fund returns as well as the compensations and final effective results for the client. For the most accurate returns of the funds, please see the website of the fund manager. Results achieved in the past do not guarantee future performance. For the most recent returns please see the website of the fund manager. Please note: the compensation given by DEGIRO is on a non-committal basis. DEGIRO is not obliged to do so and can change or end the compensation on any moment. Of course we will always communicate such changes to you. The compensation only applies to negative returns as a result of negative interest and management costs. Loss suffered on an investment made by the fund will not be compensated by DEGIRO. This risk is low. Do I run more risk with money held in a Money Market Fund than on a bank account? With Money Market Funds, you run credit risks just as with a bank. The portfolio is after all invested in bonds (loans). However, Money Market Funds, and in particular qualifying Money Market Funds, adhere to very strict investment policies. Investment is only allowed to be made in bonds with a very high credit ratings and a short duration. The credit risk is therefore very limited. The deposit guarantee scheme does not apply to Money Market Funds. However, their low risk applies for assets of both above and below €100,000. That is why Money Market Funds are often used by institutional parties to hold large amounts of money in a safe way. In total, approximately €1 trillion is currently held in Money Market Funds in Europe.(Source). Moreover, your investment in Money Market Funds is just as safely separated from DEGIRO as all your other investments at DEGIRO. What happens when an issuing institution in which a Money Market Fund invests goes bankrupt? In principle, if such a credit event takes place on a loan without collateral, the whole amount that has been invested in the issuing institution can be lost. In case the fund assets are 5% exposed to such a credit event, then the value of the fund can fall by 5%. Every €100 in Money Market Fund participations are then valued €95. The risk for such a credit event however is very low due to the high credit ratings and short duration. Can I choose to hold money in my DEGIRO account instead of participations in the Money Market Fund? No. In the Netherlands, investment firms are not allowed to hold the money of clients. Therefore, this Money Market Fund structure has been set up. What costs are associated with a Money Market Fund? There are no costs associated with the buying and selling of participations in the Money Market Funds. The management fee for the Money Market Fund is included in the fund return. This fee can be found in the prospectus of the fund, see the website of Fundshare and Morgan Stanley Investment Management. More information about the compensation for a negative return as a result of management costs and negative market interest can be found below. How does the negative return compensation work for the Money Market Funds? For many clients, the market interest rate of their local currency will be negative. We want to prevent our clients from being affected by this negative interest as much as possible. That is why we have decided to compensate on a non-committal basis the negative return in the Money Market Funds as a result of the interest and management costs. It is possible that the value of a Money Market Fund falls as a result of losses suffered on an investment made by the fund. This can occur if, for example, the Dutch or German state can unexpectedly no longer meet its payment obligations. In such a case, DEGIRO will not offer any compensation on the losses incurred. This risk is however very low. The compensation is entirely non-committal and does not create any rights and does not oblige DEGIRO to follow the same approach in the future. DEGIRO pays this compensation on the basis of commercial considerations. DEGIRO reserves the right to waive this compensation. DEGIRO will inform you ahead of time in the case of such changes.The compensation will be paid to you directly once per quarter. For the differences in compensation for the EUR Money Market Funds and an overview of returns and compensation per available Money Market Fund, please click here.